I have a fondness for literature that makes a strong connection to music. The two (written word and music) are surprisingly similar but are rarely combined (or at least not well). Seeing a mystery using music in the plot caught my eye and I knew it was something I would want to read. This book is an absolute delight and I can’t wait for more Gethsemane Brown stories. Gethsemane Brown is a classically trained musician who accepts a job at an all-boys school in the Irish countryside. It’s not an ideal job, but she needs some work. One of the (few) perks is staying in the house of a former famous composer, Eamon McCarthy. But Eamon, and his wife, died twenty-five years ago in what was declared a murder-suicide, but the ghost of Eamon still haunts the house and he appears to Gethsemane. He needs Dr, Brown to get his case re-opened and prove that he did not kill his wife, or himself. Eamon is persistent and Brown does get caught up in the search, but in return she convinces Eamon to write another musical piece that she gets to debut – conducting the boys’ orchestra in a major competition. As if the demand to re-open and solve a twenty-five year old murder wasn’t challenging enough, there are problems at the school and the musical boys have no confidence in Brown (though only because of the history of revolving directors that have come and gone at the school. Winning the competition could lead to a new, much more prestigious job back in the United States. Author Alexia Gordon does such a fantastic job here. She creates a very real world, despite a sense of the supernatural (ghosts). And even within the supernatural aspects, Gordon has created some interesting rules (“I’m eternally banned from the church and church yard. Can only go as far as the front gate”). The mystery is pretty straight-forward – there aren’t a lot of red herrings or diversions, but Gordon keeps the story moving forward because we are interested in, and care about, Gethsemane. Although incredibly talented and above the curve in her field, she is also a ‘real’ person with human reactions to problems. Brown does get caught up in the murder investigation (it’s a murder mystery after all) but I still would have liked being present at the boys school and seeing her get through to the kids a bit more. Still, this was a superb introduction to a new series and I recommend it highly. P.S. Dr. Brown happens to be African-American. It certainly makes her achievements more inspiring given the social status afforded to women and African-Americans today. Looking for a good book? 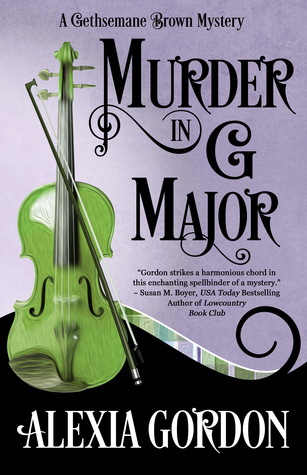 Murder in G Major by Alexia Gordon is a delightful mystery that embeds music with the supernatural and with a mystery of a decades old murder.